Kids love our Cheesy Cheddar Pasta Sides, which layers rotini pasta with our scrumptious cheddar cheese sauce. Why not use it with our Chili Mac Casserole and indulge your own inner child? Cheesy Cheddar Pasta is rated 3.0 out of 5 by 34. Rated 1 out of 5 by Zero from ...Why? Been a big fan of this stuff for years. Been eating over Kraft since I was a teenager. But apparently Knorr hasn't heard the expression, "if it ain't broke, don't fix it." They changed up an already great recipe. It's bland, doesn't have that super cheesy taste it used to and then they added parsley to try and pretty it up. Knorr, In the words of my parents, "i'm not mad at you, I'm just disappointed." 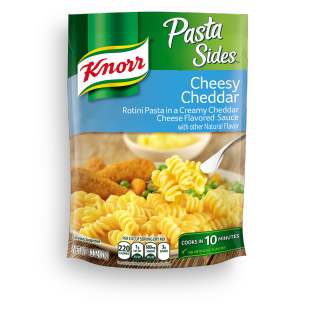 Rated 1 out of 5 by Kristin23 from Used to be good This used to be my favorite of all the Knorr PastaSides, I would eat a few packs of this a week. BUT... They changed the recipe. It was perfect before. Now it tastes fake, not cheesy and just wrong. They added parsley (for color?? ), and it doesn't compliment the flavors at all. I can't even eat more than a couple bites now. Throwing out the packages I have and not buying again. Rated 5 out of 5 by amarie123 from loved it quick and easy to make, kids even preferred it to mac n cheese, tastes great and is filling! Rated 5 out of 5 by JoshBecker44231 from THANK YOU FOR CHANGING THE RECIPE BACK!!!!!!!!!!! Within the last, I would say 6 months, the packaging got a nice re-brand, and with it, the bland sauce and the stupid parsley are gone. Thank you for listening to our years if complaints.